So this is your first San Diego Comic-Con? 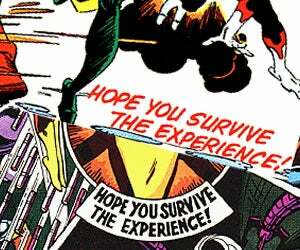 Congratulations... but just remember what they used to tell everyone who was joining the X-Men for the first time: Hope you survive the experience. Here're some tips to help you do that. If you've spent any time with the program schedule, you'll have noticed that there's far, far too much going on at almost all times for you to be able to fit in everything that looks cool. Don't worry; we'll give you our picks of where to find yourself tomorrow, but for now, just breathe deeply and realize that SDCC is a zen experience as much as a comic convention: Once you find yourself able to let go, you'll find everything a lot easier. San Diego is big. And we don't just mean "important in a pop cultural sense," we mean "it's literally very large." You're going to do a lot of walking, and a lot of standing around in line. It's not as ridiculous as it sounds to suggest that you make sure that you're prepared for more strenuous exercise than just sitting in your office, looking at the internet all day (or maybe that's just us). Well, unless you end up living in Hall H - home of all the big movie panels - for the entire con, in which case, you're probably fine. Not just in terms of what panels you want to attend, but also in terms of what you want to buy, who you want to meet, and what booths you want to see on the main floor. Study the program and find out where you want to go and when; you'll save yourself a lot of time, trouble and accidental meetings with minor celebrities who wish that you'd remember their guest-shot on Babylon 5 that way, and isn't that what you really want? Firstly, once you've made your plan? Go back and look at lesson #1. And then, bear in mind that you're probably going to find yourself accidentally running into some minor celebrity that will completely charm you at some point during the weekend (It's always Noel Neill for me, but admittedly, that's normally Wondercon) or find yourself in the middle of some weird cosplay dance party that you didn't expect, and that occasionally wonderful things can happen as well as disasters (But it's normally a disaster). You've all heard the story about the fan who accosted Alan Moore in the restroom and, being so demanding of recognition, attention and potentially urinary stream of the legendary creator, broke Moore's mind so much that he became a hermit who believed in a sock-puppet god, wrote Lost Girls and never attending a comic convention ever again, yeah? It's not just a general "Don't be a jerk to creators and celebrities" thing, either; try and remember that everyone else at the con is pretty much having the same experience as you (Barring any unforeseen personal disaster on your behalf, in which case, I'm sorry), so trying to rein in all jerk tendencies will result in less chance of physical altercation that may leave you even more unhappy. Yes, the San Diego Convention Center looks a bit like the Battlestar Galactica has crashlanded beside the water and been painted white. You will find cylons within, as well as people who think they're part of the colonial fleet. Do not be afraid. Bring cash. Maybe not enough cash that you have to wrap it into a suspicious-looking wad wrapped with rubber bands, but enough that, when you suddenly discover that the guy with the sweet print that you want to buy doesn't take credit cards, you won't have to spend thirty minutes in line for the one ATM at the con that's still working. On a similar note, bring water, because you'll need it sooner than you think. Snacks, too. Remember when you're a kid, and you went to Disneyworld/land and had to wait in line for "It's A Small World After All"? San Diego Comic-Con is a lot like that, only you're waiting to find out about limited edition Cobra Commander figures instead of watching terrifying mechanoids mime to a muffled-yet-cheerful song about the global village. There will be lines for everything: panels, signings, trying to pick up that limited edition Cobra Commander figure. It's the nature of the beast, so just accept it and get chatty with the people around you. Make it a smaller world all on your own, y'hear? #8: Don't Stare At The Booth Babes, Cosplayers, etc. Yes, they're there to be looked at, but there's good looking and there's "You're making me rather uncomfortable when all I'm doing is trying to celebrate the innocence of Mary Marvel, Captain Marvel's underage crime-fighting sister" looking. There's a fine line, and we're not even sure where it is, but it's definitely there. Even if I succumb yet again to a complete inability to speak in front of a large group of people (Chances of this happening? Fair to good; I apologize in advance), you'll still have Annalee, Meredith, Charlie Jane and special guests Douglas Wolk and Bonnie Burton to entertain and educate you on that which has blown our minds over the last year. We won't even be that upset if you all leave halfway through to go and see the Middleman panel, if only because at least two of us want to do the same thing ourselves. If there's a tenth tip, it's just this: Have fun. San Diego Comic-Con, more than any other, is its own alternate reality that you have to experience for yourself. Just remember to drink lots of water, keep your sense of humor and bathe more than once during the whole thing, and you'll be fine.